By the time he got his first architectural commission in California, Frank Lloyd Wright had been designing homes for almost two decades. 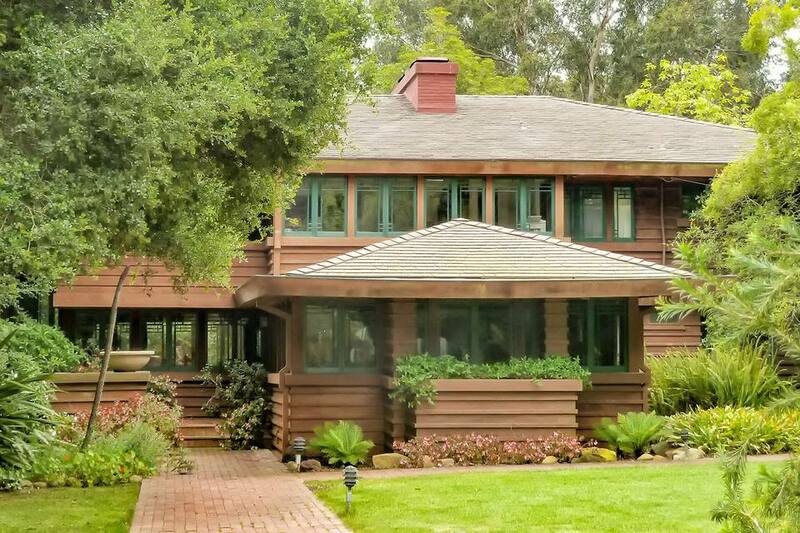 His earliest California design is the only California example of his Prairie-style architecture and in fact, the only Prairie-style Wright house west of Nebraska. The Stewart House was designed in 1909 and built in 1910 as a vacation home for a Scottish accountant and his family. The original plans included the main house, a gardener’s cottage, stables and a work shed. All except the cottage were built. On the plans, Wright called the house a summer cottage, but its size hardly seems cottage-like. The house has six bedrooms and 3.5 baths and 4,691 square feet of living space, with more than 350 windows. Originally the house sat on five acres, but the current lot is one acre. The entry area is low-ceilinged, barely high enough for a tall person to stand upright. It opens into a two-story atrium surrounded by banks of windows that have a view of a wooded area. Exterior balconies flank the living room on the second story. Outside, the horizontal, board-and-batten redwood siding helps blend it into its surroundings, as do the shingled roof and green window frames. Shortly after he designed the Stewart House, Wright left for Europe, where he produced a portfolio that helped to cement his reputation abroad. Because of that, the house was built without his direct supervision and the final layout is slightly different than the original. By the time Wright returned to the United States, he had moved away from Prairie style and after that created the Hollyhock House and his textile block houses in Southern California. The Stewarts owned the house until 1942, selling it to Greta Blickenstaff, who in turn owned it for 42 years. Jerald Peterson bought the house in 1986 and restored it. The Los Angeles Times newspaper wrote an interesting article about in it 1993, the last time it was for sale. You can read it here. Writer T. C. Boyle now lives in the house. He wrote the book The Women, which is about Frank Lloyd Wright's life. It's a project he started after buying the house designed by the story's protagonist. Writing for Architectural Digest, Boyle recounts how the house came to be his: He received a phone call from his wife: "At first I had a hard time making out what she was trying to tell me, because she was sobbing. Why was she sobbing? Because she'd found the house we'd been looking for all our lives and was choked with despair over the thought that someone else would get it before she could sufficiently motivate me to jump into the car, race to her side and make an immediate offer on the place." Which he did. Boyle also wrote an article for Sunset Magazine called A Tall Man in a Short House, which describes his experiences with the house. In 2009, when a fire broke out nearby, Boyle spent most of the night on the roof with a garden hose in hand, keeping the embers from catching his home on fire. About that, he wrote: "this preservation business is most definitely not for the weak." To find out more about Prairie style, try Frank Lloyd Wright's Prairie Houses by Carla Lind. The house is a private residence and no tours are given. You can drive by and get a look at the front from the street, but you need to know that even though the address says Hot Springs Road it actually faces Summit Road. The Stewart House isn't the only Wright site outside California's metro areas. You'll also find several houses, a church, and a medical clinic in some of the most unexpected places. ​Here's where to find Wright sites in the rest of California. You can also see Wright Sites in Los Angeles and in the San Francisco area.